Early childhood education is a term that you may have heard by people in the field of child care or teaching. However, did you know that there is a well-established set of skills that early childhood education professionals are trained to boost the development of young children in five very specific areas? Educating a young child is not all about their academic development. That is only one area among many that children have to develop. Investing in children’s lives in these areas when they are very small can enrich their ability to grow and make progress. Try working on all these areas at home, too. You may take it for granted that your children begin to gain the skills of dressing themselves, asking for food at the table, or washing and drying their hands, but these are learned behaviors that bring growth to children when they learn them. Realize that you, and your child’s day care, are bringing enrichment to your child’s development when teaching a child to pick up toys when asked or training them to understand how to avoid dangers (like a hot stove). Social interaction involves much more than teaching a child to interact with peers. Adult interaction and self-concept are also important aspects to teach young children as part of their social development. As your young child grows, they will develop an understanding of their social role through learning how to show appropriate affection, responding to greetings, participating in activities, and begins to appropriately communicate a range of positive emotions. Your child has two main areas of motor skills that all are under constant development while they are young. First, there are gross motor skills. These are abilities like crawling, walking, running, jumping, and crouching. Second, there are fine motor skills. These are abilities like picking up a cheerio, scribbling with a crayon, and fastening buttons. 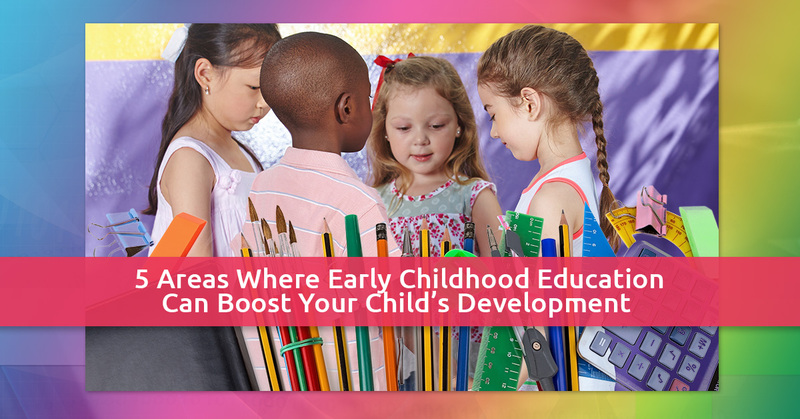 Your child’s early childhood development should include opportunities to develop both skills. This is the area of developing your child’s mental ability, including attention, memory, reasoning, academic skills, and perception. Simple activities like finding an object hidden under one of two cups can help boost your child’s attention, and matching colors can develop their academic skills. The curriculum that your child’s day care uses shouldn’t miss any of these five areas, and when you choose Rainbow Chimes, you are choosing a premier day care in Huntington where your child’s complete early education is important to us. Enroll your child today.